Most kendoka have heard the term sutemi. Whilst usually translated as sacrifice, the literal meaning is “throw away the seed”. 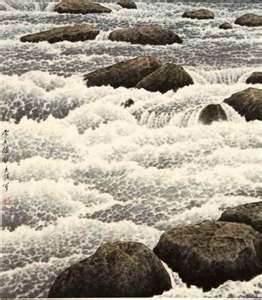 The concept refers to a poem describing a horse chestnut in a fast moving stream. If left whole, it would sink. If the kernel is abandoned, the husk would float with the current. 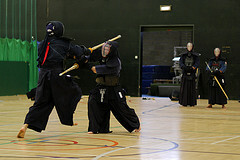 In kendo, sutemi means committing yourself one hundred per cent to an attack without fearing the consequences. Shishin on the other hand is the state where the mind is preoccupied or dwells on a particular aspect of your or your opponent’s kendo, which makes it impossible for the body to move freely. 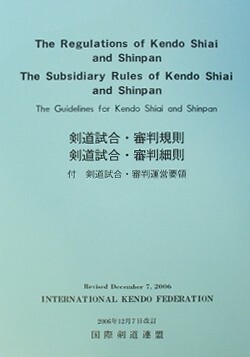 No prizes for guessing that sutemi is regarded as a desirable element in kendo and shishin is not. Correct tobikomi men is a practical illustration of sutemi. We enter our opponent’s distance and launch ourselves forward with full spirit and no thought other than hitting men. If our opponent moves away or counters, it doesn’t matter. Once you start a technique you should complete it with all your energy. In uchikomi-geiko or kakari-geiko it is easy to take this do or die attitude, in shiai or jigeiko it is more difficult. Very often we worry about our opponent’s reaction to our attack. For some people this causes a general fear of attacking. For others, it results in them stopping mid-technique rather than giving away the point. This “stopping” is my pet hate in keiko. Not only does it strangle many potentially successful shikake waza at birth, but it also robs the stoppers opponent of the opportunity to practise oji-waza. Many people take the view that shiai is about not losing, but surely the reason for taking part is to win. It could be argued that both equate to the same thing, but the mind-set of winning is about courageously exploiting any opportunity with all your mental and physical power. In keiko we talk about utte-hansei, utarete-kansya (reflection on how we made a successful strike and gratitude for being hit). This does not mean that we are masochists, but that we learn as much from our opponent’s success as we do from our own. I am now recovered from man-flu. Thank you well-wishers for your concern! I was back in the dojo last week and on Thursday had a visit from the British Army kendo team who are training for an inter-forces competition this weekend. After kihon practise we had a friendly shiai and finished with jigeiko. During jigeiko the newest member of the Army squad stood there waiting for me to hit him. I am not keen on conversation in keiko, but thought a few words might be in order, so suggested that it might be a good idea for him to try attacking. He then expressed the view that it would be better if I went first. I then politely asked how long he had practised kendo, to which the response was 17 hours. I then did a quick calculation along the lines of an average of 8 hours keiko per week, over 50 weeks per year for 43 years, gives me about 25,000 hours, so perhaps he would like to attack first and catch-up. Talking to the rest of the squad in the pub after training, it was obvious that our friends in the forces have very different challenges to us civilian martial artists. With members being deployed at short notice to Afghanistan and Iraq, it is difficult for the same group to train regularly together, and with an emphasis put on “competitive sport”, forces teams are made up of experienced players and those who are just keen to give it a try. They then go through short periods of concerted training leading up to competition. As a good team member my reluctant attacker was practising “not getting hit”, with team strategy in mind. 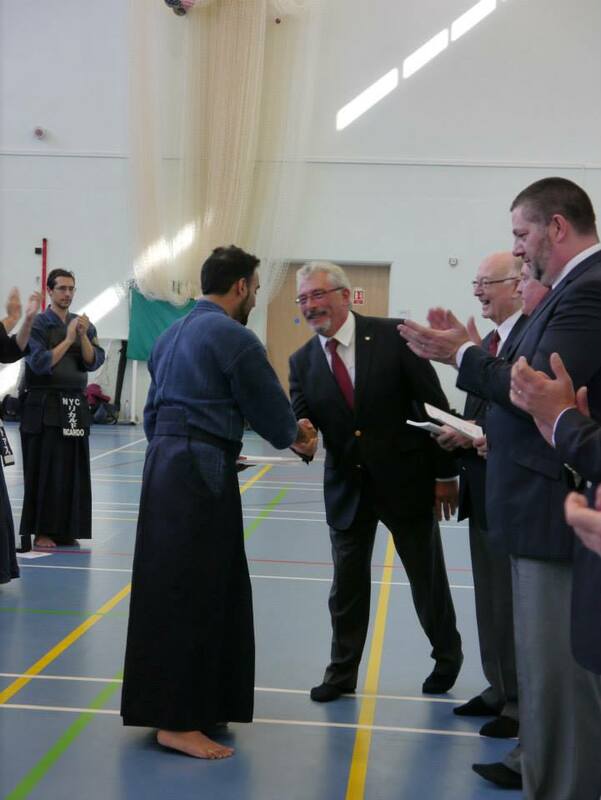 It is good to know that kendo is now officially recognised by all three branches of our armed forces and many British universities including Oxford and Cambridge. Whereas kendo in the UK used to be practised only in unofficial clubs, it is now starting to gain more establishment acceptance. The trade-off is that these institutions expect to see a healthy level of competition along the same lines as other more established sports. Oxford and Cambridge have their boat race and their varsity kendo competition. In the same way the Army, Navy and Air Force have regular inter service competitions, as they do for Rugby. So Army Team, I hope you were successful on Saturday and that kendo continues to increase in popularity. As for the man with 17 hours experience behind him, he was doing brilliantly under the circumstances. Following the 15WKC referee’s seminar in Japan and the Paris Taikai and in preparation for the WKC, I am in the process of crystallising my thoughts on what is and what isn’t ippon. 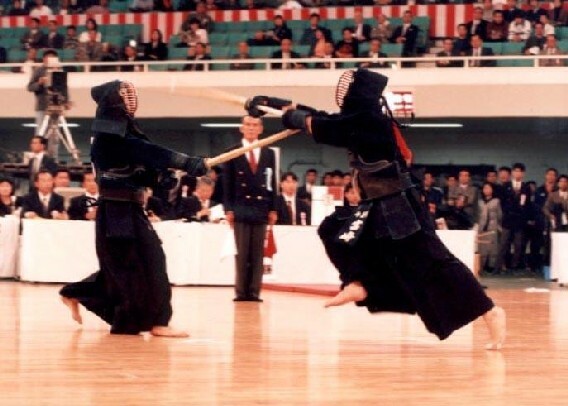 As with any other element of high level kendo, be it scoring the point yourself or validating the successful strike made by another, there is a large amount of “mushin” involved. Whilst there are clear objective criteria for what makes a point, the action happens at a speed where an instantaneous, subjective reaction is required from the referees. The only question that there is time to answer is – Is it ippon? Of course the elements required to make a point are documented in the rule book. To achieve ippon a player must have the intention to hit the point. He must strike the correct target area with full spirit and correct posture, the strike must have sae or snap and zanshin must be shown after the attack. From a referee’s perspective these points are law; however in the time it takes an athlete to reach the target, the referee has no time to go through the check-list. He must make an instant decision. A referee’s evolution is similar to a child’s. He starts copying mum and dad and his flags dutifully go up with those of the other referees. He then moves into the rebellious teenage period, where his decisions are most likely the opposite of his two peers and finally on maturity, he aims to harmonise with his team mates, (but not at the expense of truth as he sees it). With experience he learns to move so that he is better situated to see the competitor’s movements and the reactions of his colleagues, even to anticipate the player’s actions. Nevertheless when an attack is made, an instant decision is required, and it is what fills your eyes and ears at the time that dictates whether the flag is raised. With that in mind, waza needs to be sharp, accurate and delivered with purpose. Zanshin should be full of spirit without celebration, otherwise you risk withdrawal of the point with torikeshi. Above all ippon should be delivered with 100 per cent commitment. If the player does not believe in his actions, it is unlikely that he can convince the referees to do so. So, referees and shiaisha gambatte. Helton asked for my thoughts on why it is so hard to score ippon from hiki dou. Wearing my referees hat (or blazer), I would say that of course every case is different, but more often than not it is because few hiki dou have sufficient sae or snap to justify ippon. If that is not the case, then it is because hasuji (angle of the blade), is incorrect. When you make a hiki men, you do so in a straight line, stepping back to give yourself enough distance to strike with the datotsu bu of the shinai. You also strike in an up/down motion so it is quite simple to generate the momentum to make a strong, sharp cut. With hiki dou you need to ensure that the target is open, lift your hands up to strike, then adjust the hasuji and hit the dou with the correct part of the shinai whilst making one quick step back. In my view it is not easy for many people to do this, hence the poor ratio of successful attacks to attempts. Dou in any direction is a difficult target. 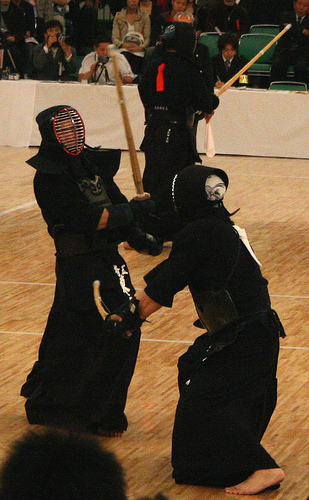 Most shikake or oji dou are unsuccessful because the attacker hits the dou whilst moving across in front of their opponent so that the strike is made with bent arms and is therefore weak. As we have discussed before, a good dou strike should be made directly in front of your opponent, with your right hand pushed forward. If you think about this applied to hiki dou, you have not only to be clear of your opponent from tsubazeriai, but you must give yourself enough room to punch forward with your right hand as you make the attack. So you need to generate significant propulsion from a standing start to do this in one step. Gyaku dou is even more frequently doomed to failure. 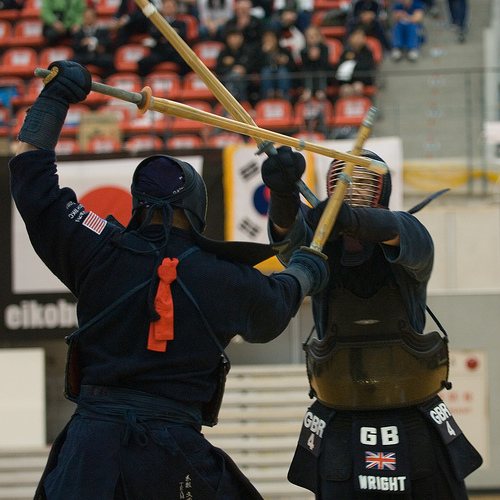 Whilst not classed as a hiki technique, the strike is usually made as you step back. With this waza referees are looking for a more powerful cut. The reason behind this is that samurai originally wore daisho (two swords) in their belt and that when the long sword was drawn; the kodachi usually remained in their belt. That meant that a cut to the left dou needed to be strong enough to cut through the hilt before it reached the target. The only tip I can offer on hiki dou is to start in tsubazeriai by pushing your opponents hands down. He is likely to react by pushing his hands up in a reflex action, exposing the target. You should step back as far as you can starting with your left foot, keeping in a straight line and strike dou as hard as you can by pushing the hands forward, turning your right wrist so that your palm is parallel with the floor. Take another step back after hitting, keeping your shinai tip pointed at your opponents nodo to complete your zanshin. The last step is to hope that at least two of the three shinpan like dou.